• Max: "I'd like to learn as much as I can in order to be in the best possible position in 2018"
No sign yet of a winter break for Maximilian Günther. He's heading straight to Japan after his two days of tests in the FIA Formula 2 in Abu Dhabi. Günther will undergo his first round of testing in the top-class Japanese SUPER FORMULA championship on Wednesday, 6th December at Suzuka's Formula 1 circuit in Japan. 20-year-old Günther will test for Team Le Mans who have been in the line-up since the very start. The team produced the very first champion of the series, Ralf Schumacher, in 1996. Ex-Formula 1 driver Kamui Kobayashi drove for Team Le Mans in 2015 and 2016. 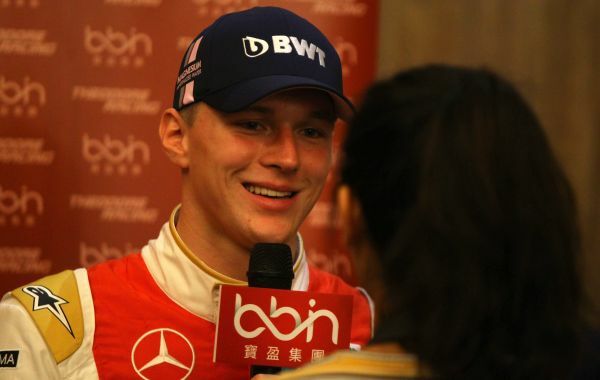 Two-time Macau winner, Felix Rosenqvist, took the wheel for the outfit last season, 2017. Many famous drivers have already entered their names in the record books of the Japanese SUPER FORMULA championship. Current Formula 1 drivers Pierre Gasly and Stoffel Vandoorne have contested the series, as have Indy 500 winner Takuma Sato, former F1 drivers Kazuki Nakajima and Pedro de la Rosa, DTM driver Loïc Duval and three-time Le Mans winner, André Lotterer. The racing cars used in the Japanese SUPER FORMULA Championship have long been considered as suitable machines, in which to prepare for Formula 1. The 2-litre turbo engines produced by Japanese manufacturers Toyota and Honda develop more than 550 bhp in a car weighing 660 kilogrammes and put huge demands on both the world's best young talents and on more established racing drivers. After testing successfully in the FIA Formula 2, Günther will head directly to Suzuka from Abu Dhabi where he drove with Racing Engineering, one of the world's most successful training outfits, at the Yas Marina Circuit. The week before he secured fifth place in the famous Macau Grand Prix. Max Günther: "Macau, Abu Dhabi and now Suzuka! It's amazing just how much experience I'm gaining for next year as the season draws to a close. I'm looking forward to my first race outing at Suzuka and to the car, with which I'm as yet unfamiliar. I'd like to learn as much as I can in order to be in the best possible position in 2018. The Japanese series has been very famous for some time now, also in Europe, and is a great route into Formula 1, so obviously, I'd like to make a good impression again."